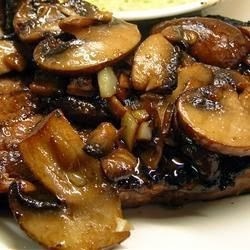 These mushrooms are the quintessential topping for all types of steak. Also excellent over baked potatoes. I have people calling me and asking me for the recipe even years after I have made them for them. They are that good! Heat olive oil and butter in a large saucepan over medium heat. Cook and stir mushrooms, garlic, cooking wine, teriyaki sauce, garlic salt, and black pepper in the hot oil and butter until mushrooms are lightly browned, about 5 minutes. Reduce heat to low and simmer until mushrooms are tender, 5 to 8 more minutes.